Traveling to Fairbanks to view the northern lights is a popular activity, especially during Aurora Season August 21 – April 21. In fact, if visitors travel here and have a minimum of three nights actively out during the evening hours, the chances of seeing the aurora is more than 90%! For many, taking a photo of the aurora you see is one of the best souvenirs one can bring home. For some, capturing a decent shot and posting it to their Instagram or Facebook pages can give friends a serious case of FOMO and travel envy! Rentals are available! If you don&apos;t want to travel with essential equipment for shooting the northern lights (like a tripod) or need backup gear (lenses) you can find what you need at our local, full-service camera shop. Don&apos;t hesitate to give them a visit or call! Tripod: Overwhelmingly, the local pros always recommend using a tripod. Whether you are shooting with a large DSLR, point-and-shoot, or smartphone, don’t leave home without this important piece of equipment. Why? Northern lights are viewed when it is dark outside, so long exposure shots are necessary. The camera must remain as still as possible to get a clean, clear shot. Camera with manual setting or long exposure setting: Full manual functions for exposure and focus, as well as a sufficient exposure capability range. Any digital SLR will work; most mirrorless cameras, and some point and shoot cameras as well. Image quality will be dramatically reduced with a point and shoot, however. Camera settings and experimentation: The pros mostly recommended the following settings, but the best thing to do is experiment within these parameters as digital “film” is cheap! Set lens to infinity focus (∞). Wide-angle is the lens of choice for capturing the aurora. Set the ISO: The best thing to do here is to experiment based on the conditions and factors you are experiencing. Start with 1600 and adjust as needed. Exposure: Typically a 6-10 second exposure works for most sessions. Batteries: The cold can really zap your battery life, so bring backups and make sure they are fully charged before embarking on your hunt. Headlamp with “red light” setting. A few of the pros mentioned this and we feel it is worth passing on. A headlamp that has a red light feature can be very useful for a couple of reasons. One, you can view your camera/phone, car or other gear and not disturb others around you with a bright light. Secondly, the red light minimizes your own eye dilation. Zip-Lock bags and lens wipes: From pro feedback, it is important to have a few zip-locks on hand and clean cloth for wiping your lens. The zip-locks can be handy for keeping your batteries together and warm with a hand-warmer (see below) and can help you avoid condensation if moving from the cool outside to a warm interior. Stay warm: When the lights come out, you will be outside most of the time, so it is important to be comfortable in the cold with layers of warm clothes. If you do not want to buy or travel with winter gear, it is possible to rent locally. It is very important that cotton is avoided from head to toe, it is recommended that synthetic or wool garments are used instead. For more information on layering, check out our video on how to dress for winter. Hand and foot warmers: Stock up on these while in Fairbanks (sold at every sporting goods store and grocery store) or before your trip. They are so handy and really do make a difference! Book a tour: Most people find comfort in going with a tour for at least one night to get their bearings and to learn from a local guide. We recommend this as well. Guides can give tips for viewing and photography and hints about where to go locally if you plan to head out on your own. Location, Location, Location: Map where you are going and give yourself plenty of time to get there. You’ll want to be away from artificial lights and have a good view of the northern sky. “Aurora chasing is like fishing. You can put yourself in a good spot at a good time of the day and this will increase your chances of catching a fish, but ultimately it is up to the fish to go after your hook. You can put yourself as close to the "Auroral Oval" as possible (Coldfoot, AK). You can put yourself there at the best time of the night (2 hours on either side of solar midnight - which is not the same as chronological midnight). But whether you see the aurora or not is ultimately going to be governed by factors beyond your control (solar activity, weather).” ~Robert Weeden, Northern Alaska Tour Co.
Fairbanks and the surrounding areas are full of unique sights that shouldn&apos;t escape your camera. The most important thing is to come prepared, experiment with your settings before heading out and consider booking an aurora viewing tour to get the lay of the land. Most of all, have fun and stay warm out there! National Geographic Magazine: “Fairbanks is the best place in the U.S. to take in the northern lights." 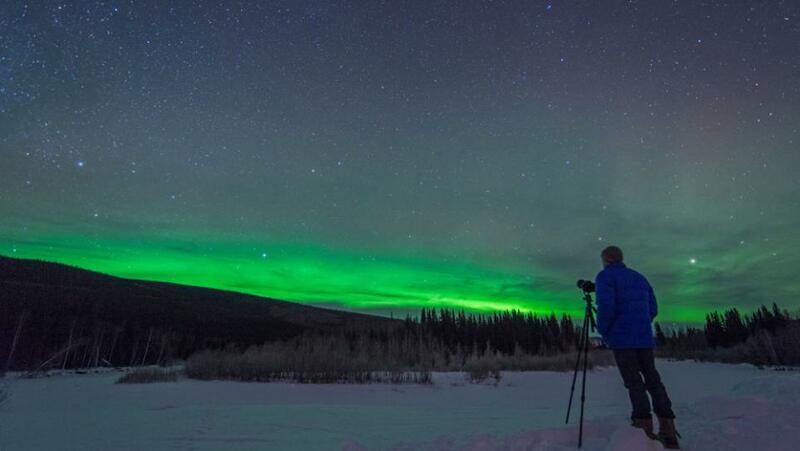 Travel + Leisure and Smithsonian Magazine both call Fairbanks the best place to view the northern lights in the U.S.